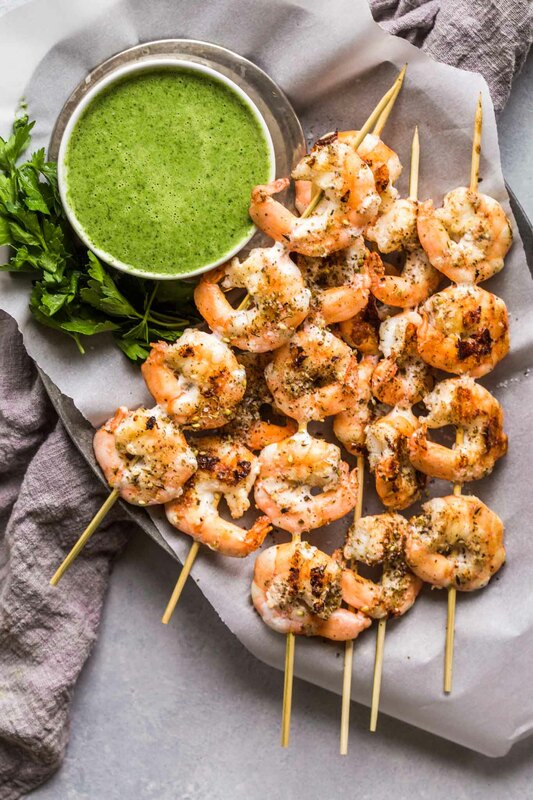 Grilled Shrimp Skewers with Green Tahini Sauce are perfect for summer barbeques and so simple to prepare. Last month I had the amazing opportunity to visit Cincinnati and learn about all things Kroger. Here in Portland, our Kroger stores are Fred Meyer and QFC, and I shop at them regularly, so I couldn’t wait to meet the team behind their stores, learn about their new products and services and be inspired by their Zero Hunger Zero Waste initiative. We were treated to a breakfast made of items which are considered by store standards to be “unsellable” but that are still perfectly edible and ready for consumption. Day old bread was turned into an amazing orange-scented french toast, meat that was about to be pulled from the shelves was ground up and made into yummy sausage patties, and veggies that may not be as pretty as they should be were transformed into a green shakshuka that could be served at any popular brunch spot in Portland. We learned that Kroger does this with all their products that have been taken from the shelves. They have made huge efforts to not only donate more food, but also to donate more balanced meals which will help promote healthy choices and aid those 1 in 8 Americans who struggle with hunger every day. I love the fact that my favorite store just became that much better in my mind. What an amazing concept and backing from Kroger. Hearing these stories and learning about this also made me feel so good that there are these kind, thinking, and supportive people backing the brand. After such a serious topic, it was time to have a bit of fun. A bunch of us amazing bloggers got together and had a cook-off/potluck/BBQ mashup, with each of us cooking from a specific category: appetizer, main dish and dessert. 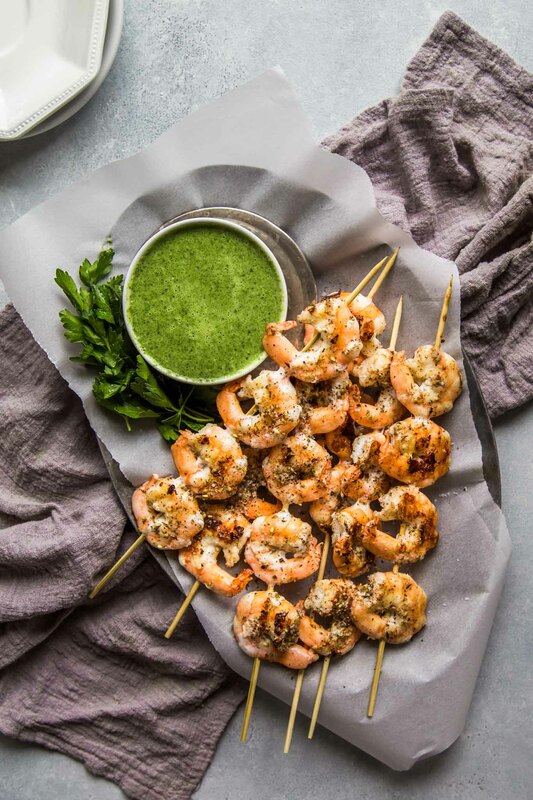 I was assigned to the appetizer group and taking their theme of “Red, White and BBQ” to heart, I went with a dish that was perfect for summer grilling – Shrimp Skewers with Green Tahini Sauce. I also wanted to go a bit easy on myself, since we were told that we’d be cooking for a group of 50. So, I looked back in my “easy recipe” arsenal and immediately thought of my Mojo Sauce. That bright green, piquant sauce loaded with cilantro, parsley, garlic and jalapeno. 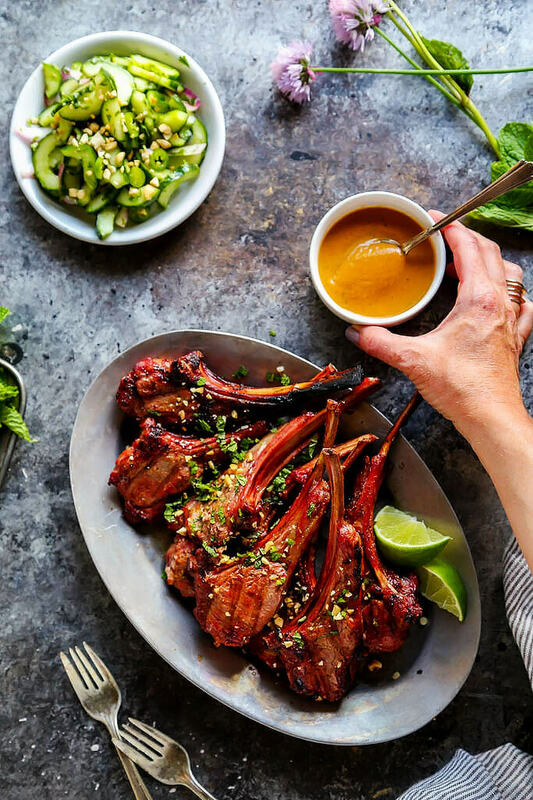 Not only is it the perfect sauce for topping grilled meats, but it also comes together in like, seriously, five minutes with the help of your blender. After skewering like 250 shrimp, I popped them onto a hot grill, let them get nice and pink on the first side, and them flipped them over to finish. Shrimp will cook up super quick on your hot grill. They should take about 5 minutes total, depending on your heat level. Just keep an eye on them. When they’re pink, they’re ready to flip. As an added bonus, these grilled shrimp skewers can totally be done ahead of time for the most part. You can skewer them ahead of time, and you can also make the green tahini sauce up to three days prior. You can also pre-grill the shrimp and serve it chilled. 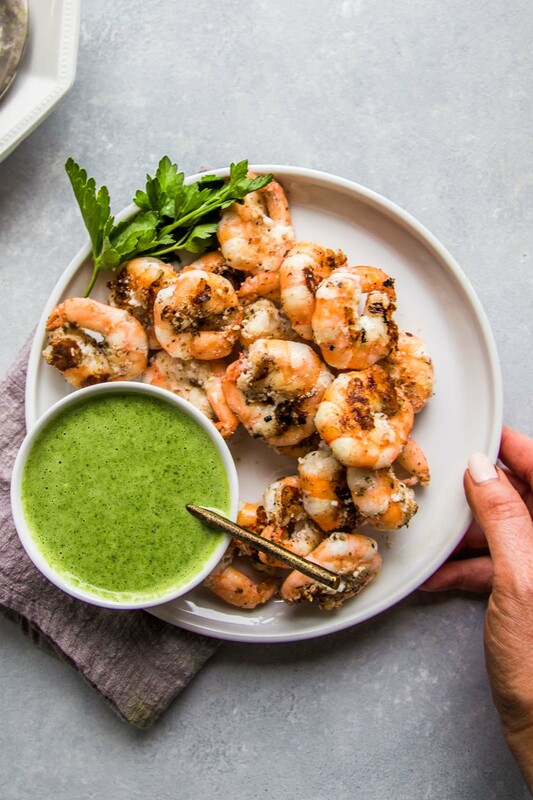 Did my Grilled Shrimp Skewers with Green Tahini Sauce win the competition? Yes!!! 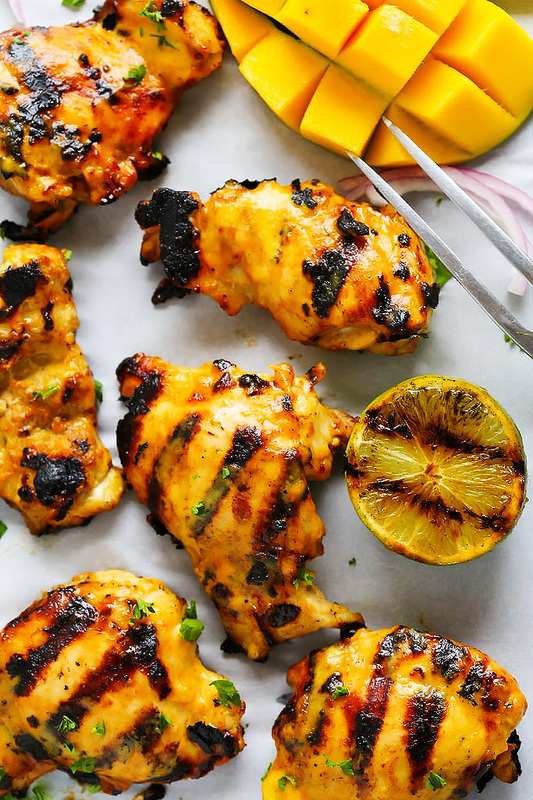 So, you definitely need to give them a try this grilling season. 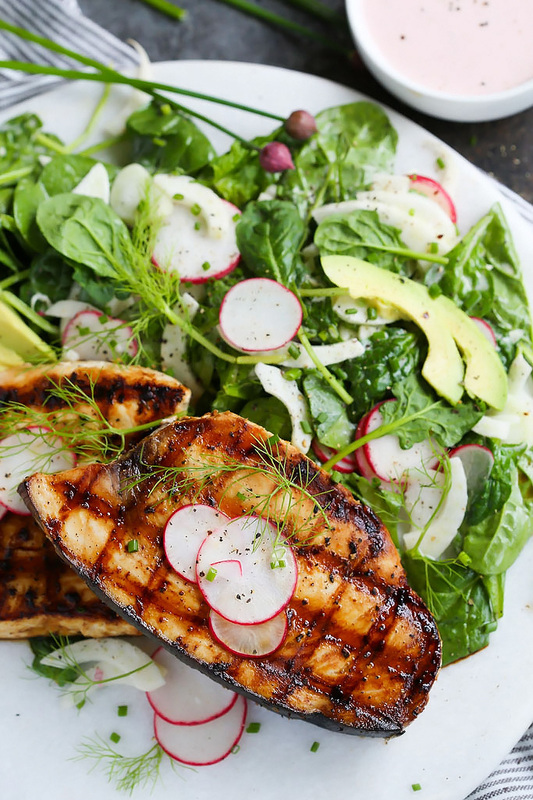 Do you have any simple, quick and easy grilling recipes in your arsenal? I’d love to hear about them in the comments below. Place all ingredients in blender and process until combined, and desired smoothness. Season to taste with salt. Toss shrimp with olive oil and season with salt and pepper. Arrange on skewers. Grill for 2 minutes on each side until the shrimp is pink, and cooked through. Serve with Green Tahini Sauce on the side. If you loved these grilled shrimp skewers I would appreciate it so much if you would give this recipe a star review! Also, be sure to snap a picture of your finished dish and share it with me on Instagram using the hashtag #platingsandpairings and tagging me @platingsandpairings. 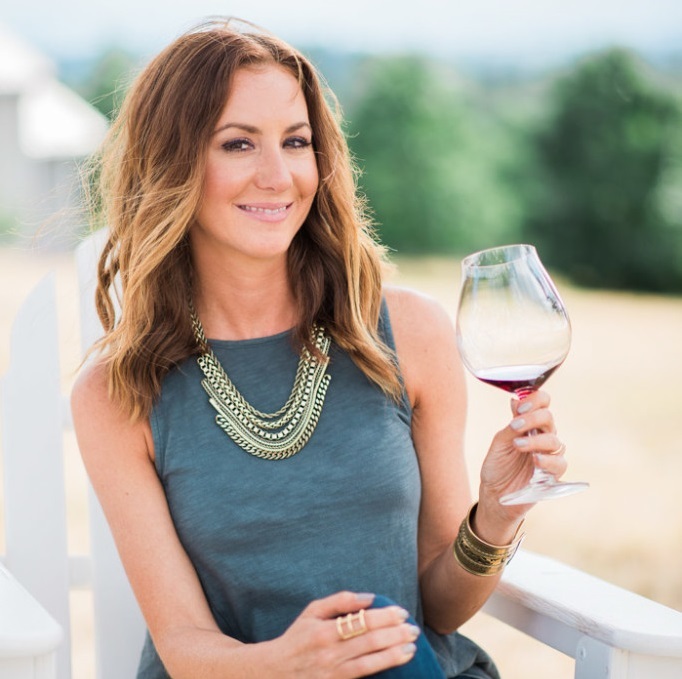 Pinot Gris makes a nice match with its crisp minerality and citrus notes. For something unexpected, and budget friendly, try a Vinho Verde with these shrimp skewers. Sounds so good! Can’t believe that’s just salt and pepper on the shrimp, so easy and looks so good–love that little bit of crispiness on them! Congrats on winning!!! Cool to hear about the food waste initiative. I have definitely seen employees loading up bins of old produce at Fred Meyer… I hope it is going somewhere that needs it! I just saw tahini at the grocery store and almost bought it—but then I couldn’t think of what I’d make with it. Thanks for answering that question! Of course – I hope you enjoy Catherine! I remember watching your Instagram Stories when you were doing this cooking competition. Congrats, I can see why they won! Can’t wait to try these this summer… maybe even this weekend! On a side note, that’s awesome to hear about Kroger. Glad to know they’re making good use of older foods. Thanks Mary – These are so yummy (especially the sauce)! When we finally get together for a BBQ, I’ll bring them! I have always thought how sad it is that grocery stores waste so much food that they take off of the shelves – I am glad to hear that isn’t necessarily true! These shrimp look incredible! 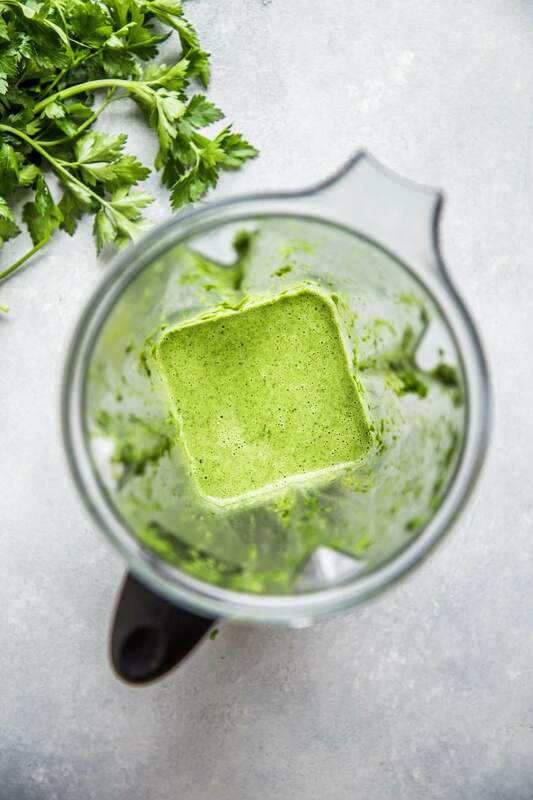 I love a good green herby sauce, so I’m excited to try this recipe with Tahini! This tahini sauce is delicious! It works great with grilled fish too! Thank you very much! Of course! I’m so happy you liked it LoraA!